ISRAEL HAS AGREED to a ceasefire with Hamas in the Gaza Strip and opened talks with Syria in a flurry of secret negotiations across the Middle East. But at least one Palestinian resistance movement says Hamas, the Palestinian Muslim Brotherhood, has made too many concessions to the Zionists. Israel and Hamas have agreed to a truce that started on Thursday, ending months of bitter fighting and Palestinian negotiators are confident that all the militias in Gaza would abide by the agreement. Hamas took over Gaza in June 2007, driving out forces loyal to Fatah, the political faction led by Palestinian Authority President Mahmoud Abbas. Since then, Israel, the Palestinian Authority and the imperialists have sought to isolate Hamas. Israel declared the Gaza Strip a “hostile entity” and imposed a blockade making it difficult to get supplies in and out of the occupied territory. The first stage of the truce will lead to at least a partial end of the Israeli blockade. The second stage of the plan would focus on the return of a captured Israeli soldier by Hamas forces and on a deal to re-open the main Rafah crossing into Egypt. Hamas official Ahmed Yousef said he hoped that the ceasefire would lead to a further opening of the crossing points from Israel into Gaza and an increase in the number of supplies. He said that the aim now was to push ahead talks on a prisoner exchange, as well as a new round of talks in Cairo between the rival Palestinian factions of Fatah and Hamas. Egypt, which has worked for months to bring Israel and Hamas to an agreement, said both sides had accepted the first stage of the deal. But the progressive Popular Front for the Liberation of Palestine (PFLP) has not agreed to the terms saying the Hamas deal was way below minimum expectations. Politburo member Rabah Mhaanna said the truce was flawed because the Israelis were still occupying Palestinian land and still oppressing the Palestinian people. The PFLP would do nothing to cause the collapse of the ceasefire, he said, while stressing that its terms fell far short of the conditions that Hamas had told them it had set during the negotiations with the Israelis. For his part Israeli premier Ehud Olmert is looking for a dramatic breakthrough that will get him through the next election while still giving little or nothing to the Arabs in exchange. Olmert is on a corruption rap accused of taking over $150,000 in bribes over 15 years from a Jewish-American businessman when he was Mayor of Israeli West Jerusalem. Olmert claims the money was used for political campaign expenses but the Israeli National Fraud Squad investigation will almost certainly force him to resign and call fresh elections. If Olmert can win the release of the Israeli soldier held in the Gaza Strip and the two others captured by the Lebanese Hezbollah national resistance in the 2006 war his chances, and those of his Kadima bloc, will soar in the polls. A lot will depend on negotiations with Syria over the return of the Golan Heights, which Israel has occupied since 1967 and the resolution of the dispute with Lebanon over the adjacent district of Shebaa Farms. Last week Syria and Israel held indirect talks in Turkey which left both sides “extremely satisfied” according to Turkish Foreign Minister Ali Babacan. Now there’s talk of a peace summit between Olmert and Syrian President Bashar al Assad. Syrian Foreign Minister Walid Muallem says Damascus has received Israeli commitments for a full withdrawal from the Golan but this has naturally not been confirmed in Tel Aviv. Likewise Israel would need to return the Shebaa Farms to Lebanon, a tiny 25 square km district of 14 farms of alleged strategic importance, to meet Hezbollah’s demands for an end to the confrontation with Israel. In any case the Israelis will want the Syrians to cut their links with Iran and Hezbollah as part of the deal. But real peace will not come to the Middle East until the legitimate rights of the Palestinian Arabs are restored. THE DECISIVE “No” vote in the Irish referendum on the European Union’s Lisbon Treaty is a victory for the working class of all Europe – and beyond – and a setback to those bosses, financiers and imperialists who want to forge Europe into a giant, single-minded world imperialist super-power. The Irish are the only EU nation to reject the treaty because they are the only ones to have had a referendum. All the evidence is that if other EU countries had put the treaty to a popular vote they would have got a similar answer – as the French and Dutch people rejected the EU constitution a couple of years ago. The treaty was the same in content as the constitution with a few tweaks and changes. The treaty was bad news for the workers of Europe and good news for the bosses; it would lead to an authoritarian European super-state with minimal democracy and civil liberties. Many labour movement organisations are fooled by better trade union rights, human rights and so on in other EU countries into thinking the EU can be a force for the benefit of the working class. But this is not the agenda of Europe’s ruling class, who are trying to create the superstate to protect only their own interests – as with any bourgeois state machine; the fewer rights they can give to workers the better for them. Their agenda was to reduce the existing rights that many workers in Europe have won over the years in hard struggle down to one lowest common denominator. And they were looking at the British model to impose that on the rest of Europe. Others point out that most EU governments took a more progressive line than our own on George Bush’s illegal adventure in Iraq. But that was not because they were anti-imperialist – these were the same governments that eagerly jumped the gun to subvert and butcher socialist Yugoslavia in the early 90s. It was good they did not back Bush’s Iraq war but that was because they could see – unlike Blair – that ultimately there would be nothing in it for them. They could see it was ill-planned and ill-judged and in any case they were benefiting after Saddam stopped trading Iraq’s oil in dollars and traded it in Euros instead. 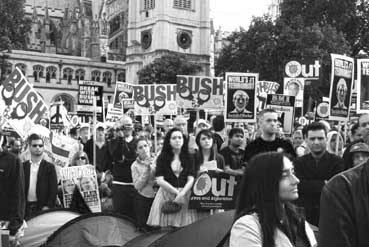 The European ruling class used progressive arguments in their media attacks on Bush and Blair in order to enlist popular support. And for a while their interests coincided with the peace movement and the worldwide working class. But ultimately their main argument with the United States government is that it is a rival imperialist power seeking to control the oil-rich Middle East – a region that was once under European imperialist control. Other progressives are deterred by the right-wing of the anti-EU movement who are motivated by petty jingoism, xenophobia and racism – which we completely deplore. We are working class internationalists and we stand in solidarity with all of Europe’s workers – against the ruling class EU quasi-state machine. Now the leaders of the EU are divided on the way forward. They have three options: to give up on the treaty altogether; to wait a few years, rewrite the treaty and try to pressure the Irish people into changing their minds in a new referendum; or to go ahead with the treaty anyway but leave Ireland behind as a second-class EU nation. Of course Ireland could opt out of the EU altogether; it greatly worries the EU leaders that their own populations might realise that European countries outside the EU have prospered quite well in recent years and have far lower living costs with much less bureaucracy. They do not want to see Ireland leave, its people prosper and the workers of Europe wake up to the burden they are carrying in raised living costs in the EU.